On my recent visit to Nice in France, I was walking with my fellow foodie through the streets close to the Old Town, rather lost in the narrow streets and desperate for a coffee. What caught my eye was the black and white umbrellas and checkerboard tiles outside. It was absolutely beautiful and to my surprise, the restaurant served bio and sustainable food! The exact reason why I went on this tour! Check out the website of Café Paulette in Nice and even better, if you are ever in the area it is a must visit for fabulous food and an amazing collection of natural wines! It helps that the staff is super friendly as well. Anyhoo, on our last day in Nice, we decided to treat ourselves to our third meal at Cafe Paulette (it was that good) and it did not disappoint! We were served a beautiful salmon ceviche with avocado cream and of course we enjoyed our meal with a bottle of ice cold natural wine. This is my take on the recipe and I have tried to identify as much of the ingredients as I could. I have kept it simple and it is still delicious! I promise you that it is as simple as just mixing and blending the ingredients together. You can definitely impress your friends at the dinner table with this dish as a starter! 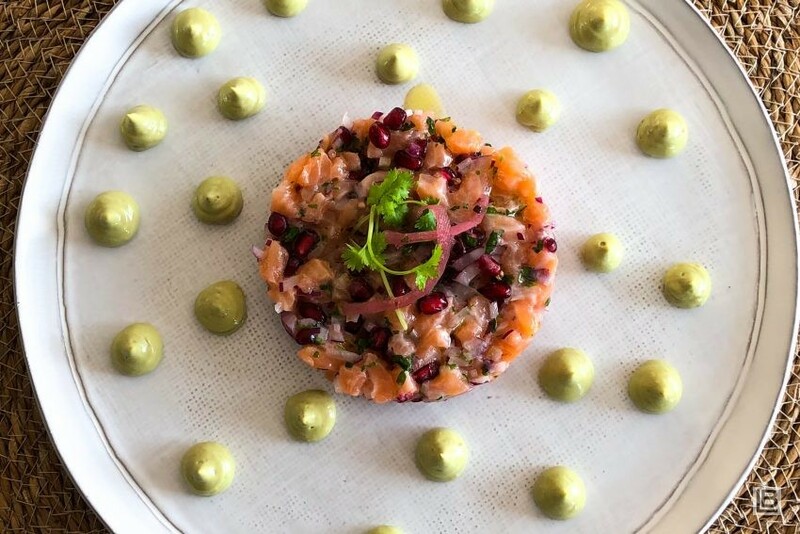 For the salmon ceviche, simply mix all the ingredients together in bowl and season to taste. Add a little more or less of the lime juice and set aside. Place all the ingredients for the avocado cream in a blender and blend until smooth. Place in a piping bag. To plate. Place a ring mould in the centre of your plate and place half of the salmon in the ring. Lightly press down. Randomly pipe little meringue-style peaks onto your plate. Remove the ring and garnish the salmon with a few micro herbs. Tips : If you do not have lemon confit, then you can add about 1 tsp lemon zest and ¼ tsp white wine vinegar.